Hey hey, I’m Dennis Crowley the co-founder and CEO of Foursquare. I’ve been working on “building things that make cities easier to use” since I was in grad school at NYU. My grad school thesis turned into my first company, Dodgeball, which we sold to Google in 2005. For the past six years, we've been building Foursquare and Swarm, which are now used by more than 50M people around the world every month! Most of you probably know us for our two apps. The Foursquare app can help you find great places literally anywhere in the world and Swarm turns every day into a game as you check-in to earn coins, stickers and mayorships. The company is also hard at work behind the scenes tackling technical challenges. We've built a contextual awareness engine that allows us send all those smart pings to your phone and smartwatch and ad targeting technology (Pinpoint) that helps brands connect w/ people based on places they go. I also enjoy such things as snowboards, soccer, fixing broken dirt bikes, shooting arrows and throwing axes. Ask me anything! @dens I noticed the sticker! It feels very Oregonian (my hometown!). @dens Do you have any "Requests for Startups" - ie things that you would like someone else built (or problems someone else solved)? @tomasruta Ha, I have a list in my Evernote of "things I wish people would build off the 4SQ API" .... we're starting to get around to just building these on our own (Foursquare hack projects -- stay tuned). As for non-Foursquare, I hate the existing TV structure and I really like the *platform* that Apple rolled out today w/ AppleTV + apps. Excited to see where that goes. @dens If you/Foursquare had a 1bn USD budget for acquisitions, who would you buy? Hey Dennis! I've been using Foursquare since the early days and swear by it in NYC. Props for bringing back gamification to Swarm! What's one big lesson you learned from splitting Foursquare in two, and what would you do differently if you could do it all over again? @jackdweck Hey Jack! Thanks for asking the first question! #1 thing we learned from the process of splitting the apps was the importance of communicating (and overcommunicating. and overcommunicating some more) to the fans and users of the product. I think we did a "just okay" version of this, instead of doing an A++++ job of it. I think we left some people confused early on and it took us a full 6 months or so to *really* explain the story to folks. In short, we underestimated how much work it would be to really tell the story of why we decided to split the apps. @felipecn I think the first version of Swarm that we launched was "just okay" --- we tried to make it more utility (e.g. the "where is everyone?" app) and we misread how many people just LOVE LOVE LOVED the game. But we heard you... and we made it a huge priority to not just bring the fun back, but to do it in a way that made it 10x better. I love what the team has come up with and I am VERY PROUD of the product and team behind it. Hi Dennis, I always loved being a Foursquare Superuser. Can you maybe explain a little bit what it means to you and Foursquare and are there any future plans for it? @colazionearoma The Superuser Community is one of the most important parts of the Foursquare story + ecosystem. There are more than 40,000 of you around the world (!!) and you're a big reason our data is so fresh & accurate. We always listen to the community and continue to build new tools (and toys) for the Superusers to play with. If you have ideas for things you'd like to see, I'd love to hear them! Hi Dennis - thanks for joining! How do you think about teamwork? What are some of the attributes of company culture that you think are most important when building teams? @corleyh Great question -- I think the most important things are (a) setting a clear leader for a team (no co-leaders), (b) giving them clear goals ("hey you gotta ship this thing by X date" or "you gotta raise MAUs by 10% by X date") and then (and most importantly?) (c) trusting them to just go out and get it done (aka: get our of their way / stay out of their business). The more we stick to these rules (and we don't always do it...) the better results we have. @dens Did you pitch Dodgeball to Google or did they find you? Do you currently self fund your projects or still look for VC/Angels? @mrwongsteven A little bit of both. I was at Google visiting a friend for lunch in 2004. Rumor got out that "one of the Dodgeball guys was in the office". And so I "pitched" like 4x that day to all different people... and then eventually it was like "you should just come here and work on this thing"
Hey Dennis, Any tips for managing your psychology as a founder? @zackshapiro You ever read this Ben Horowitz post? It's at the top of my bookmarks list and I read it like 1x/quarter: http://techcrunch.com/2011/03/31... You have to make time for yourself and your life outside of work (e.g. my wife @chelsa and I try to get out of the city every weekend). It's one of the only things thats kept me sane during this crazy ride. @dens where do you see @swarmapp in ten years? @dens Apart from gamification what do you think brought your first 100k loyal users? How did you make checking in useful or exciting for them? @dens Hey Dennis! Really love Foursquare and the gamification of Swarm has made me very excited to use it. Nice work! I'm curious to know if the rate of checkins has increased year over year in the past three years. @andimuskaj Checkins have been consistent (tho they've been WAY UP last few weeks -- since leaderboard/coins, etc -- which I guess isn't too surprising). The real story is (how much more signal* we're getting about places now (in the 2 app world) -- e.g. checkins, likes, ratings, tips, photos, etc etc... the crazy amount of data is what enables us to do so much interesting stuff with contextual awareness / predictive location tech. Dennis! What's the future of 4SQ lists and will it ever get easier to add places to specific lists, share lists, etc? @msquinn You can save to specific lists already (at least on iOS, can't speak for Android). Long-press on the 'Save' button rather than simply tapping it. @dens What is Foursquare/Swarm's beacon strategy? Hey Dennis! I'm such a huge fan of FourSquare; both check ins and now restaurant discovery. Dodgeball was a few years too early from a tech standpoint. When the iPhone came out, though, it showed you predicted both a market and tech that didn't exist when you launched Dodgeball. Any mobile trends you see coming in the future that are currently limiting Foursquare/Swarm from a product standpoint? Hi Dens, Thanks for bringing leaderboard & mayorships back. I was one of the superusers who was pissed off after the split, and hardy ever checked in on Swarm until the last update. Now I'm hocked again. Give us a hint of what is next for Swarm? Hey @dens! Today I saw an awesome project from a Foursquare designer (Input by @lankybutmacho). I'd really like to know your thoughts on side projects within the company and how you encourage and help the team with them. @dens Have you thought about using Augmented reality as a feature for Foursquare similar to how StarWalk 2 does? So i could walk down the street with my camera pointed forward, being able to see all the places, their reviews, which friends have been there etc live on my screen? hey Dennis, what are some big features you're excited about? anything new in the works? @twomouthed YES. I am working on a few new 4SQ projects now that I am really really into. Can't share here (sorry!) but you'll know em when you see em. Hey @dens. Have you ever tried an automatic check-in feature? @sebagon Yes, people hated it :) Its one of those things everyone asks for, so we built it and tested it (back in like 2011) and it was awful. So instead we focused on making it as easy and quick to checkin as possible. (1) What's something you'd really like to do, but still haven't done yet? (2) What's something you said you'd never do, but then did—and why? @melissajoykong Been thinking about this one since the beginning of the AMA (and it's been driving me crazy that I didn't have a good answer... so making this my last question for this AMA) 1. To be honest, I don't have a crazy bucket list of stuff -- I've been pretty blessed with being able to travel a bunch and having a super interesting job/career and super supportive friends and family. I almost feel guilty for not having something super awesome here, but I'm going to say cross country road trip w/ my wife Chelsa, because I've always wanted to do that. 2. In 2001 I got laid off from my awesome dot-com job and it was a huge humbling / ego smashing setback for me personally. And then 9/11 happened and there were no jobs in NYC and we got evicted from our apt, and I eventually moved out of the city and was became a snowboard instructor for the winter. That is literally the last thing I ever expected I'd do, but it was also one of the most awesome / most fun experiences I've ever had. I always think of how supportive my parents were during that really upside-down part of my life and I'm super thankful for that. @dens Thanks for your thoughtful response, Dennis. Love the story about being a snowboard instructor. Amazing how deeply tragic events like 9/11 can catapult people into some of their most awesome/meaningful/important experiences. @dens What's the % of your users who use only Swarm? Same q for Foursquare! @technologix It's roughly 40/40/20 (with the 20% being those who ping/pong back and forth between the two). When we look at this, we feel it *really* justifies our strategy to split the one app into two. Hey Dennis, In NYC, Foursquare is king. Elsewhere, it's not. When I travel to SF, I'm reminded of how little the rest of the world uses Foursquare/Swarm. What's your plan to change this? The product is objectively better than anything else, but the data and users just aren't quite there outside of NYC. And I'm rooting so damn hard for you guys to change this! Hi @dens! Long time Foursquare/Swarmapp "Check-in" user . I love the gamification/history but find it a hard sell explaining to others why do I check-in at places. "So you become a Mayor...okay....now what? You get coins. Ok....cool, so....virtual coins and sometimes free chips+salsa for the Mayor somewhere? So.....". What would be your Swarm elevator-pitch? @sarthakgrover Not every minute of every day is fun... but Swarm can turn little pockets of boringness (waiting in line for coffee, pumping gas, etc etc) into small little fun moments. 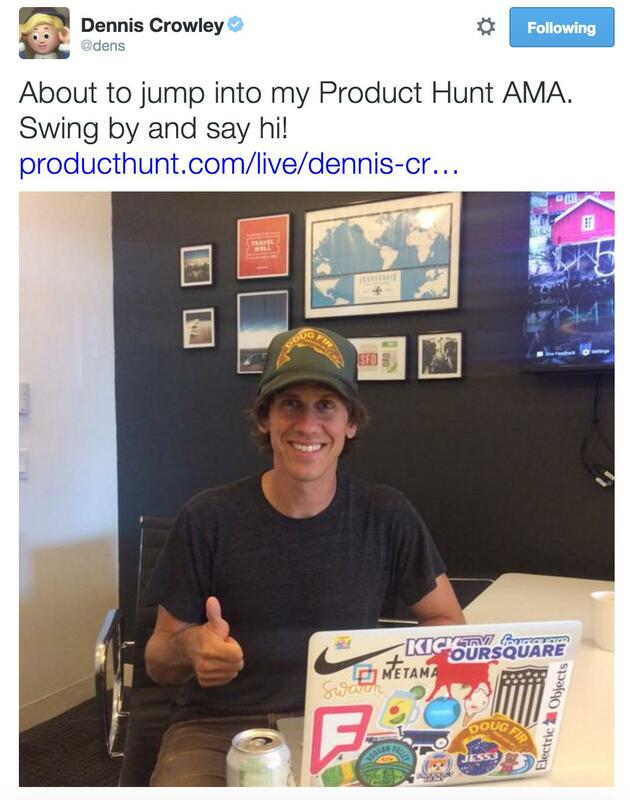 The big drumbeat for this year has been "just make it fun"
@dens Fun it is! Glad to hear about the continued fun-ification plan for Swarm, very few companies ever think about that. I love the "turning little pockets of boringness into little fun moments" description. Thanks! Hey Dennis! Q: When should an entrepreneur keep going on their project/startup or hang it up? What framework should they use to make their decision? As someone who's worked on a passion for so long and grown it to the business it is today, I'm curious what advice you can give fellow entrepreneurs here. Hi Dennis, Curious what made you first decide to become an entrepreneur when you founded Dodgeball? Hi Dennis - huge Foursquare fan. Not just as a user but the fact that 100s of apps wouldn't have been born without it! We know you love location and Foursquare will keep you busy for some time to come but if you had to choose another industry/vertical, what would you tackle today? @dens PS big fan of lists - especially planning before a trip. Hope that gets a big push in future updates! Hey Dennis, love the 'new' design of Foursquare. Such a well done job there. I wonder, what are your feelings on the role of beacon technology in the future of LBS, and are there any cities you see disproportionate Foursquare (or Geo specific SWARM) usage in? @paultomkinson Lots of beacons here today! I like the idea of beacons, but it's still really early (try explaining to the guy at the bakery that his beacon needs to be closer to the register and also needs a new battery). For years, we've been working on tech that basically does what beacons are supposed to do.. but does it without hardware. This is why all of those checkins are valuable (7 billion of them!) -- they've give us a map of the world meant to be read by cellphone sensors... and we're finding this is a really easy way to "fake" beacon technology. I haven't yet seen any ads so far on either Swarm or Foursquare. What kind of advertising experiences should we expect to see? I would imagine the contextual engine allows for some impressive targeting. Bonus question maybe? How did your appearances on Family Feud affect your career path to entrepreneurship? @tymrtn I've got ads, both on Swarm (list of recent check-ins, after a check-in) and Foursquare (in the search feeds). I'm in Paris. @dens What's your growth strategy for South East Asia? What are your biggest growth challenges in South East Asia? Curious since this is where I'm based, and would also love to be able to think about how I can possibly help. @dens Swarm & Foursquare rule. The history element provides great insights. Was there anything in particular that motivated you to build out a contextual awareness engine? @neiljain83 This is what we started the company to do... like in 2009. This sentence below is copy and pasted out of a pitch deck from YEARS ago. This is what we are building. "Someday, hundreds of millions of people will carry software in their pockets that knows when their friends are nearby and when places & experiences they’ll love are right around the corner. Foursquare will power these experiences." DUDE, I LOVE FOURSQUARE! i'M THE MAYOR OF LIKE 15 PLACES!!! Thanks for bring back the majorship's. I have been tracking myself for like the last 3 or 4 years! Eugene Turner@sircrumpet · Tech, tea and adventures. Hi Dennis, I've been a long time fan of Foursquare, and I've been loving Swarm since the split. I was hoping to cheat a little and ask two (semi-related) questions that have been on my mind for some time. 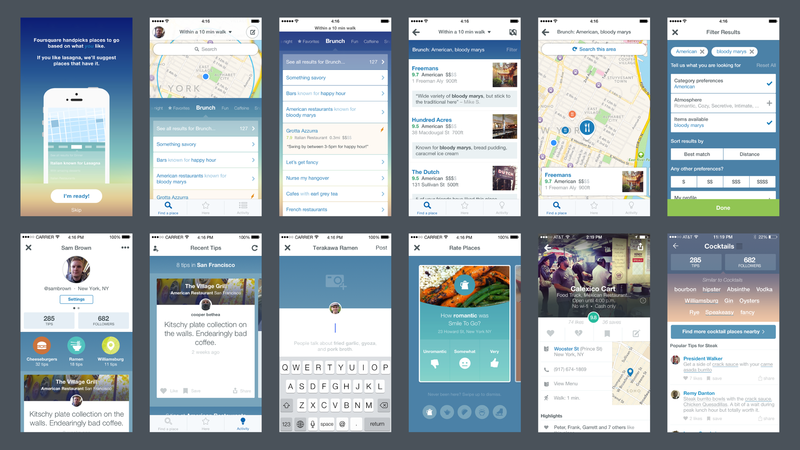 :-) Back when you launched the new Foursquare, Sam Brown wrote a great post on Medium about the design process and included a few screenshots of Foursquares that could have been. This one: particularly caught my eye because of it's emphasis on places "within a 10 minute walk". I've always kind of wished Foursquare's explore suggestions were a little more focused on places within walking distance from me, especially when I'm in the city. Can you shed some light on why you moved away from this idea? The other thing I've been wondering about (especially since the spit) is Foursquare's use in highlighting new and recently opened places, in addition to the established hidden gems. There used to be a "Recently Opened" filter in the app, but it always returned no results for me, and it's since disappeared. Are there any plans to expand on this in Foursquare, and how do you work to identify great new places given the de-emphasised nature of checkins within the Foursquare app? Thanks heaps for all the good work - Foursquare has long been one of the most useful and fun apps on my phone, and I love what you're doing to expand the platform on iPad and the Watch. @sircrumpet ps: Sam Brown is a rockstar. I remember this post well... such great work. Given how much you think about location based services - what companies or tools have you excited in the field of location, beacons etc? @brendan_o Skipped this cause I answered some other beacon Qs above. Thx! What has been the toughest lesson you've learned as co-founder and CEO of Foursquare? @melissajoykong There is nothing easy about startups. There is nothing easy about being a CEO. There's nothing easy about managing people. It often seems glamorous on TV and movies... but its really hard. The biggest lesson has been "omg this is really hard, but we have to keep doing it, because if we don't, no one else will". @dens Hi Dennis, I noticed a few weeks ago that members of your team were doing exploratory trips abroad (https://twitter.com/kvanscha/sta...). How're you thinking about your non-US audience? Anything you can share about your international plans? I'm based in Accra (capital of Ghana, West Africa) where there's a surprisingly active Foursquare/Swarm community, so I have to ask: would you happen to be planning anything for our part of the world? @dens Hi Dennis, I'm an SU3, I'd like to know if you are planning a way to keep your Super User community engaged in order to continuosly provide high quality edits (like no other platforms) in the long term. I know that Yelp, Google Local Guides, Facebook Places Editors and probably other communities have their own way to motivate and reward SU online and offline. Also in advertising (since you have now Pinpoint and other products), Google AdWords is doing interesting things with its Partners program to support agencies/freelancers, running contests and giving awards based on performance. How will the future look like for foursquare Super Users and do you see this role possibly "merged" with a rivisited Ambassador program? Thank you! @sydney_liu_sl Hey Sydney! In those early days it was never "hmm.. I wonder what people will want" ... it was more "I want this thing, my friends want this thing, but no one else has built it yet... so I guess we'll go out and build it." I tell this to people just starting out all the time --- build the thing you want to use, and if you do a job, there's a good chance your friends (and their friends) will want to use it too. @dens Oh one more thing... per this: >> What work or planning went into the SXSW launch to make sure that users would love Foursquare? .... we were scared that people were going to LAUGH at us at SXSW 2009. Literally, laugh at this ... "THIS is what you're been spending your post-Google days on? a checkin game???" .... we had no idea that people would love it as much as they did. That was a HUGE surprise and gave us a TON of confidence going back to NYC with the "well, this is now our job... let's do it" mindset. @dens What's your favorite soccer team outside the US? What's your laptop stickering strategy? Always been impressed with your spread. That Electric Objects one is particularly sweet. What's next for Foursquare in a passively engaged sensory driven world. Given the recent innovations around mobile computing where do you see the product offering playing a more active role within the core business? Offering up a consumer facing product for the next evolution or focusing more heavily on the business side around data and intelligence that can also help to power the next innovative startups in this next evolution. Hi Dennis, Is there a place for Foursquare in the new Virtual Reality industry? I'm sure there is but I'm curious to hear your thoughts on this. @remcovroom Too early to say, but I met some folks from a company called Penrose VR (http://www.penrosestudios.com/) who are doing storytelling thru VR and their work has BLOWN MY MIND. @dens saw you intro the "WEB: A Human Right" movie in NYC a few months ago. I am blown away by apps that leverage the power of connected societies like Premise and others are doing to surface new datasets. Curious on your thoughts about Swarm globally and new data that will come from connection at scale like this. @ktinboulder Ever use that app Dark Sky? The one that shows you in real time what the weather will be 1 hour from now? What if we could do that for crowds? For events? Predict where people will be, where people will want to be, etc etc. I think that's what datasets like the ones we have w/ 4SQ & Swarm can power. @dens Please predict when the gym won't be so packed... please. @omerzach Ah, thanks! I should have poked around a bit more, I have been mostly dealing mostly with the explore and checkins endpoints. @dens Signed up. Thanks for doing an AMA! @dens Thanks for doing this AMA. Besides communicating a bit better when splitting the apps, is there anything major you wish you could go back and do differently with Foursquare? Hi Dennis - how will you enhance the way that businesses on Foursquare communicate with consumers on Swarm? Do you foresee a platform strategy like FB Messenger? https://www.messenger.com/business or something different? @benjaminjparks Piggybacking off this to mention Path Talk Places, which is a now-defunct feature of Path Talk that was phenomenal. Hey @dens - how are you doing these days! This is Sarah (formerly of Explore Chicago) - I'll try to ask you a fun one: fave coffee / foodie location? fave oddball Foursquare location (Mars??) I had fun adding movie locations to Foursquare back in the day. @dens Rad! That looks delicious - will check it out next time I'm in town. And the team at JPL is amazing - definitely my social media crush. @alexcartaz Ha, zero backstory behind the elf... I just liked him. I added it as my Twitter avatar at SXSW 2007 and haven't changed him since. As for Ryan -- I ran into him in SF a few weeks back and it was great seeing him. Ryan is just a classic hustler... there's things he wants to do, and opportunities he sees, and he just goes out and grabs them. Same w/ Tristan (our very first BD intern who went on to be founder/CEO of Bevel). There's a ton of folks at 4SQ (past and present) with that same drive / mentality. Do you plan on opening up the Swarm API so that coins can be earned and used in other apps? @drewsiah I literally have this conversation every day. :) I am very bullish on these ideas (tho it's hard to turn "game currency" into "real currency")... don't rule it out tho! @dens in the hospitality industry we're comfortable using "real currency" for marketing - which is how i view "game currency". i'd much rather comp someone's meal because they played my video game than put an ad in the alt-weekly. hope y'all figure it out! oh, actually, I've got one comment. looks like your servers sending push notifications to swarm users suffer from high load. I might be mistaken but thats definitely something you guys should check. @andreymaslak Tell me more about this? Hey Dennis! A while back sam lessin wrote about how maps should better reflect level of agony in terms of how to judge travel decisions. Since Foursquare is one of the most innovative players in the mapping space I wondered if you had any thoughts about how maps could improve so that a decision to go to a restaurant or travel to a point of interest on 4sq could be an easier decision for the user. @tomlimongello Hey pal! I feel like our whole company is set up to help answer these Q's. I always tell the team here that "the best version of Foursquare is the one you don't have to remember to use" ... it's the one that knows you, and learns about you, and proactively recommends things to you. I think that's the future. "Hey Dennis, you gotta try this new lobster roll place in the East Village... because I know you love lobster rolls! Go there someday this week!" I want to get messages like that DAILY. Hey Dennis, We will be competing to represent San Francisco in the Global MasterCard Hackathon Finals in December. To better prepare, my question is- how do you see the future of the payments with small businesses in regards to credit cards, mobile payments, etc...? @ovakrat Oh man, this is more of a 30 minute talk than a 140 char answer. Someone has to figure out the POS space (loyalty, discounts, etc) in a way that works everywhere (and not in 10 diff ways at 10 diff places). I thought Google Wallet and Paypal Here and Groupon Breadcrumb and Square (and now ApplePay) would have all figured this out by now... but payments is SUPER HARD for 1000 diff reasons. My dream is that the Brand New Taco shop that just opened up down the street can someday use 4SQ data to help send a message to all the people who have been to *other taco places* in the neighborhood, and then can offer a discount to all users who actually come in and try that place. We can do the targeting now ("you like taco places! but you've never been here! go!") but the payments piece is still really fragmented. 1) Besides Foursquare, what are your favourite tools/apps/techniques for exploring the world around you? 2) When you dream of an alternative universe in which exploring the physical world is way more awesome, what things do you imagine? Hi Dennis. Why were private check-ins removed from Foursquare/Swarm? Any plan to bring them back at some point? @dens hi Dennis! Do you have certain rituals that you maintain to keep you grounded as an entrepreneur? e.g. you mentioned the bhorowitz article that you read 1x a quarter. In your opinion, what are some misconceptions about the way people travel and explore their physical worlds? 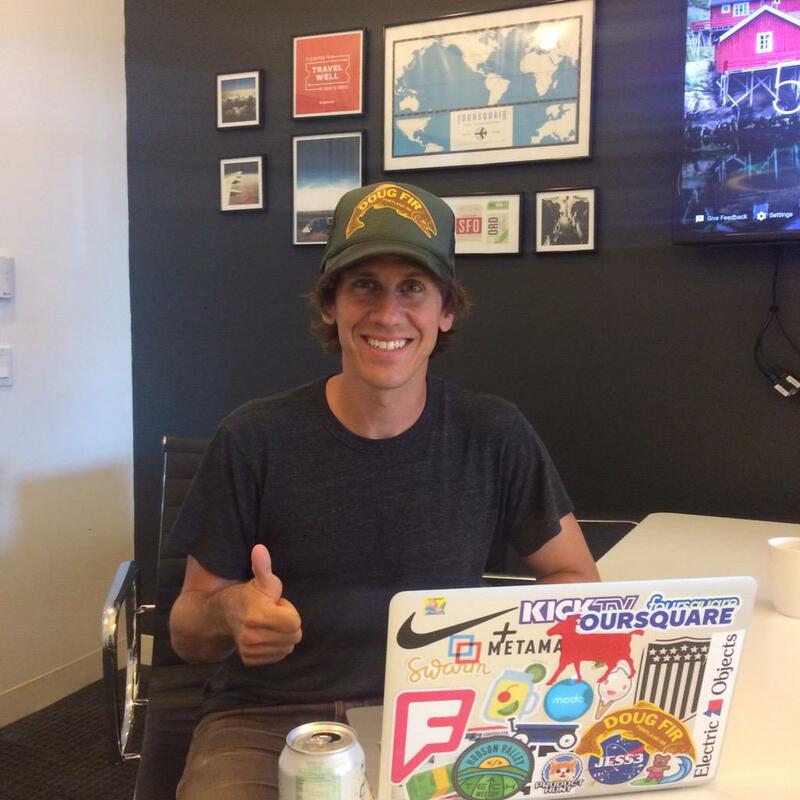 HUGE thanks to @dens for taking the time to chat with us today! Hi Dennis, I've always been a bit supporter of what you guys are building, and I am one of the few people who really supported the split from the outset. However, I still think it would offer a better experience for Swarm users if the app showed the venue profile within Swarm after check-in. This would avoid that awkward jump to Foursquare, and would mean Swarm users can view tips and write their own even if they don't use Foursquare. It seems like a no brainer to me. Is this something you have considered? What was the hardest part about gaining traction in the early stages of Foursquare?